With this highly anticipated new novel, the author of the bestselling Life of Pi returns to the storytelling power and luminous wisdom of his master novel. The High Mountains of Portugal is a suspenseful, mesmerising story of a great quest for meaning, told in three intersecting narratives that touch the lives of three different people and their families, and taking us on an extraordinary journey through the last century. We begin in the early 1900s, when Tomás discovers an ancient journal and sets out from Lisbon in one of the very first motor cars in Portugal in search of the strange treasure the journal describes. Thirty-five years later, a pathologist devoted to the novels of Agatha Christie, whose wife has possibly been murdered, finds himself drawn into Tomás’s quest. Fifty years later, Senator Peter Tovy of Ottawa, grieving the death of his own beloved wife, rescues a chimpanzee from an Oklahoma research facility and takes it to live with him in his ancestral village in northern Portugal, where the strands of all three stories miraculously mesh together. 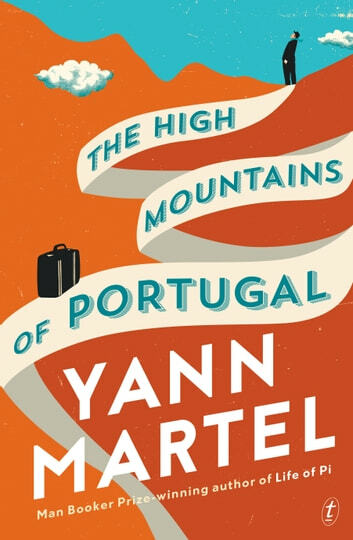 Beautiful, witty and engaging, Yann Martel’s new novel offers us the same tender exploration of the impact and significance of great love and great loss, belief and unbelief, that has marked all his brilliant, unexpected novels. Yann Martel is the author of Life of Pi, the international bestseller published in more than 50 territories that has sold more than 12 million copies worldwide, won the 2002 Man Booker (among many other prizes), spent more than a year on Canadian and international bestseller lists, and was adapted to the screen in an Oscar-winning film by Ang Lee. Martel is also the award-winning author of The Facts Behind the Helsinki Roccamatios (which won the Journey Prize), Self, Beatrice and Virgil, and a book of recommended reading: 101 Letters to a Prime Minister. I loved this so much I bought three paper copies as gifts. Three is appropriate as there are three quite different parts to this story. They're all charming & a bit heart-breaking, but a highlight for me was an elaborate parallel drawn between Christ & the detectives of Agatha Christie. Genius. A marvellous book, i couldn't put it down. Three stories relecting grief, linked by a fine thread. Beautifully written and so unusual! Please read it, keep an open mind and grieve with the story tellers.